What a great feeling. The season is over and clients at The Parish Centre are champions of division 2 after a hard fought match in which the “Professionals” as we became known beat one of the I.W.A. teams 7 – 2. 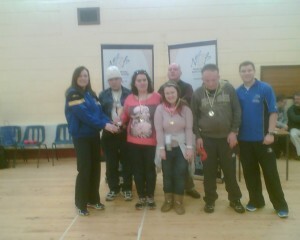 The competition was played at the Borrisokane Community Centre. It was played on a monthly basis. After six months of competition it was becoming evident that the likely final would involve the Parish Centre and I.W.A. For this to be confirmed we had to win two competitive games today (1.4.15). We beat Templemore Resources and Rehab Care to reach the final. We were not surprised to find I.W.A. waiting for us. The team we went with was Liam Seymour on the right, Flan Walsh in the centre and Kim Clarke on the left. Clients had practiced this formation on a regular basis and appeared calm and comfortable. Their coach, Patrick Collins was nervous. He knew that we had never beaten I.W.A. before. The first game was won by the Professionals 3 – 0 thanks to some fine blocking by Flan. Our second of four rounds was rescued with a great shot from Kim Clarke and we won 1-0. We lost the next round 2-0 meaning we were going into the final round with two scores to spare. Flan got to throw in the “Jack” (white ball) and followed up with a partial block. I.W.A got past and between Kim and Liam they blocked the white on both sides preventing I.W.A. from scoring. We had it won. Liam went on to land one more blue beside the Jack to give us an overall win of 7-2.
Credit must also be given to Anne Marie Maher, David Ely and Paul Dinan all of whom played in the earlier rounds helping us to achieve this divisional final. The cup is gone away for engraving. We look forward to its presentation.